Welcome to Critic's Notebook, a quick and off-the-cuff car review consisting of impressions, jottings, and marginalia regarding whatever The Drive writers happen to be driving. Today's edition: the 2018 Infiniti QX80. 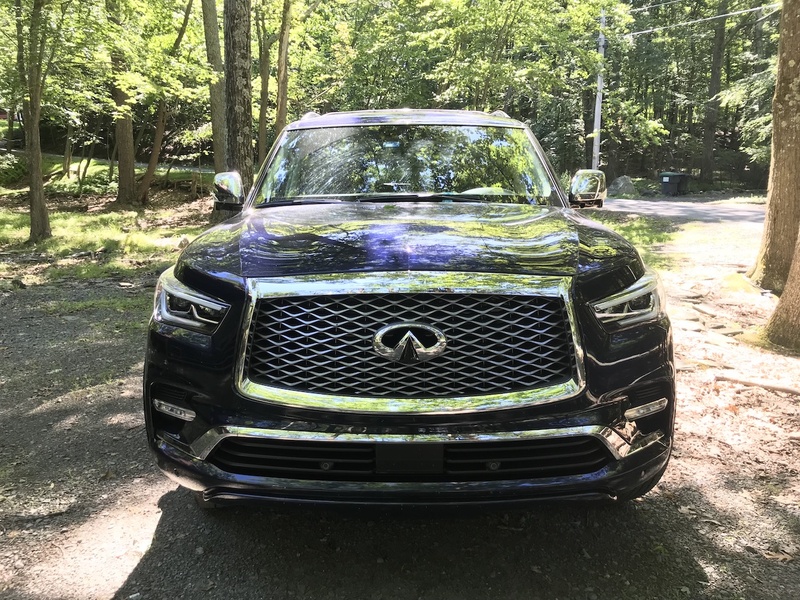 Quick Take: Infiniti's humongous full-size SUV is more handsome after the 2018 mid-cycle refresh, and surprisingly sumptuous inside—just as nice, at a glance, as the huge Lexuses with which the QX80 competes. 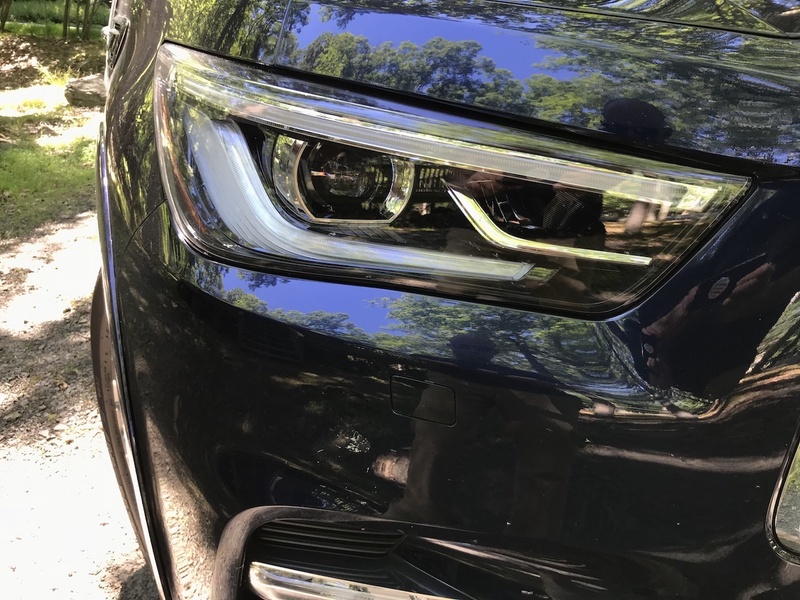 You'll need all the options, of course, and those add up quickly—and even with the $5,700 Deluxe Technology Package, you're still paying for infotainment tech that's a half-generation behind. 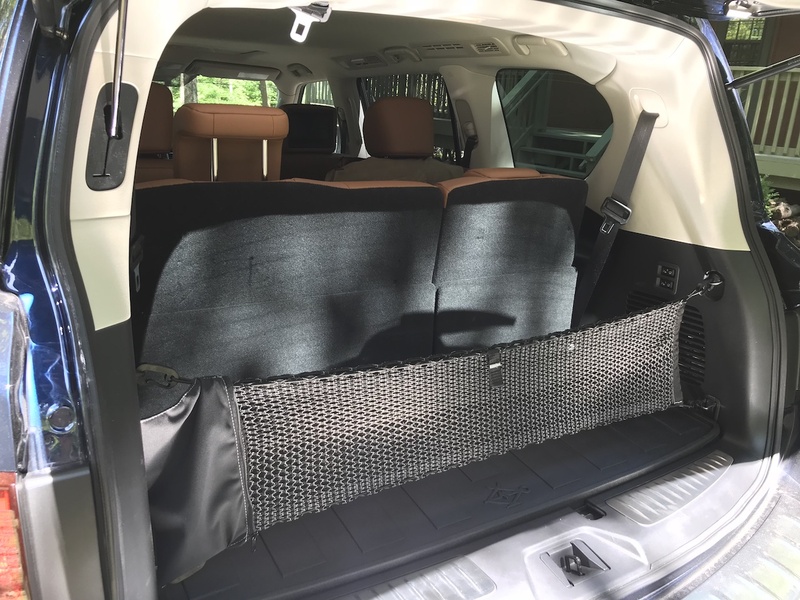 But the optional Theater Package, with entertainment displays in the rear headrests, will be popular for those hauling around a bunch of kids (and really, why else are you buying something this size?) and the ride is comfortable with plenty of power. 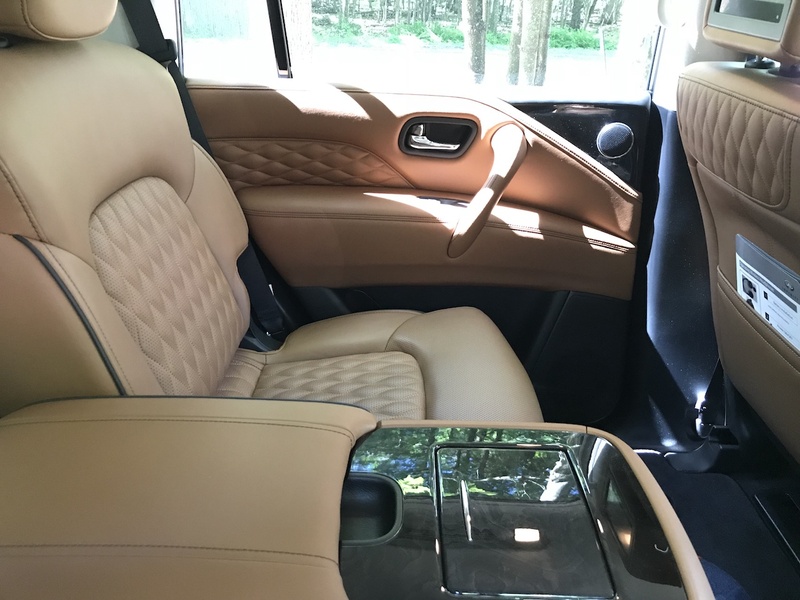 It's fair to call the QX80's underpinnings dated, but the packaging still works. A loaded, eight-passenger hauler for under $90K in the full-size luxury SUV segment is hard to argue with, provided you're willing to forego some bells and whistles and the latest in-car tech. Based solely on the fact that I was sitting high enough to make eye-contact with long-haul truck drivers, this might be the largest passenger vehicle ever made. (I put this in the "Pro" category because, in America, the Attainment of Ludicrous Size is considered the highest enlightenment.) It's so huge that you can peer over the top of Jeep Grand Cherokees in traffic. 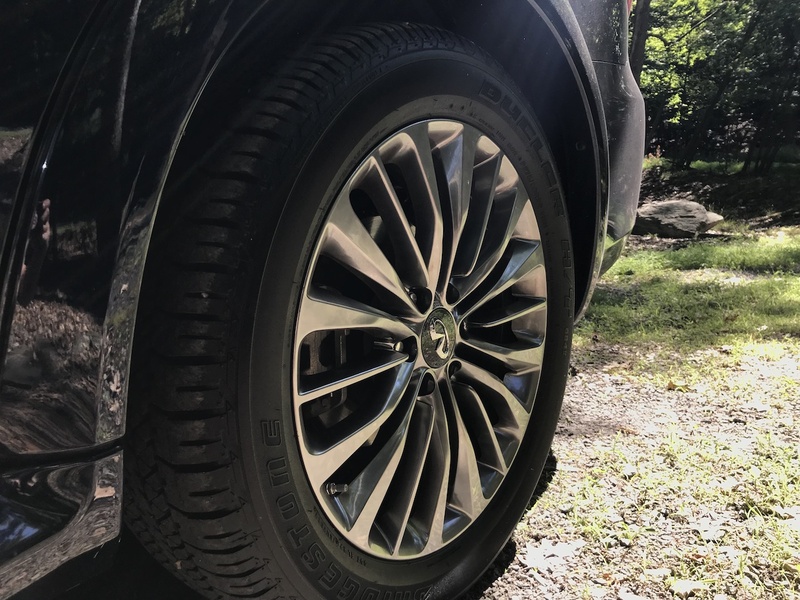 Despite its body-on-frame construction and the fact that it's the size of a tiny home, the QX80 acquits itself well on the road. It's meant for long straight stretches of commuter highway, and it is an exceptional choice for that—smooth and quiet and powerful and able to smooth most rough road surfaces—but if you mind the obvious momentum of a three-ton, top-heavy truck and pilot it like you would a boat, you can make the behemoth hustle around a curve. The steering is light and quicker than you'd expect, if entirely numb, and the suspension is limber without being overly soft. (The optional Hydraulic Body Motion Control certainly helped in that regard.) And there's plenty of power on tap. Nissan's venerable, naturally-aspirated 400-hp V-8 is a no-fuss workhorse, and there's plenty of it: mash the pedal and the SUV jumps to life with a rumble like a charging elephant (but an elephant made with softer, nicer leather and optional rear-seat television screens). I've been in Tokyo hotel rooms with less room than the inside of this car. It can seat seven people, or eight if you opt for the $850 rear bench seat, though the third row is cramped in either case. But the first two rows feel like a living room, and all the extra height translates into a lot of interior airspace. If you regularly haul a bunch of people (child-sized or otherwise) you will no doubt appreciate the extra room. It's not just roomy inside, but comfortable and upscale. 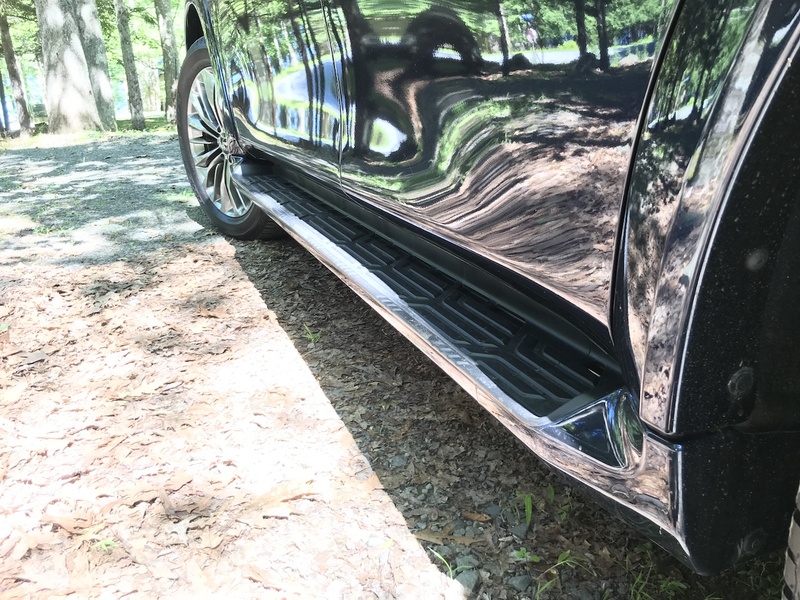 The fit and finish is quite good, and the car often feels surprisingly luxuriant. (The stitched Saddle Brown leather is handsome, and soft like an old baseball glove.) The ergonomics are good, the infotainment easy to use. The climate-controlled quilted-leather seats (part of the Deluxe Technology Package, at $5,700, which also includes a rear view mirror with digital display option, 15-speaker Bose sound system, adaptive front lighting, and a Hydraulic Body Motion Control System) were as cozy as those overstuffed reclining versions in the fancy movie theaters where you can eat a hamburger and drink craft beer while watching Isle of Dogs. That adjustable digital rearview mirror, which gives you a clear view rearward no matter how many people or how much stuff you're hauling inside, or what the weather is like outside (the camera looks through a section of rear glass kept clean by the windshield wiper) is a considerate touch, and it's not the only one: There are cut-out cupholders for extra-large mugs (it's a family-hauler, after all, and mom needs her coffee) and the pair of USB ports are now easily accessible in the dashboard. 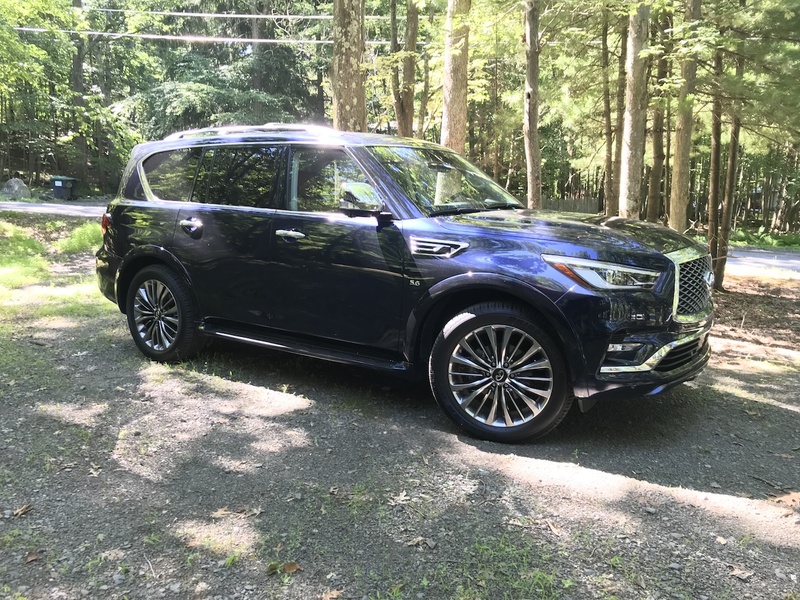 It looks good: The 2018 QX80 is handsomer now, and carries its significant heft with a more commanding presence. Infiniti's adjustable digital rearview mirror. 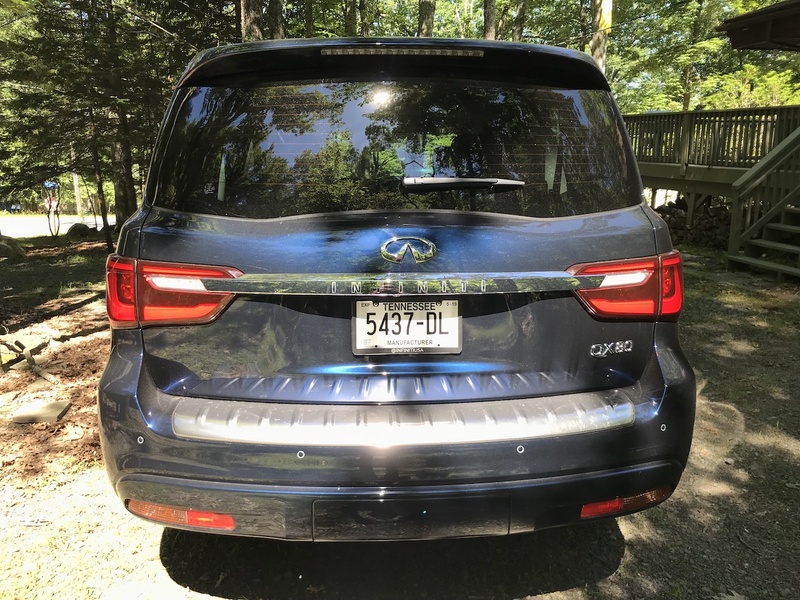 The biggest knock against the 2018 QX80 is that it's pretty much the same car as the 2017 model—and that vehicle was already a bit past peak freshness. The age shines through most noticeably, as always, with the infotainment system. The user interface is actually simple and intuitive to use, but the displays are small and low-res and lack color. It feels like sitting in an SUV from six or seven years ago. 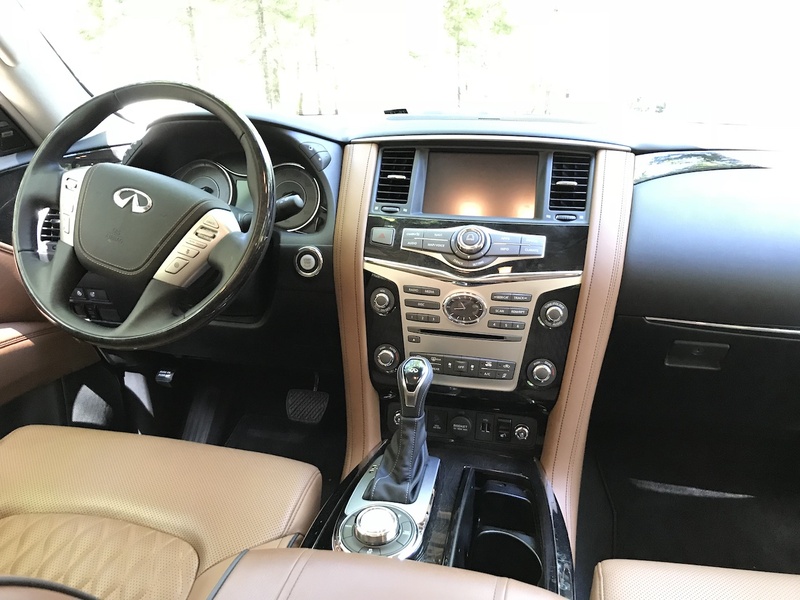 Likewise, for anyone cross-shopping the QX80 with Escalades and Range Rovers—and remember, our as-tested price climbed past $84K—the Infiniti's lack of content will be apparent. There's no head-up display or massaging seats, let alone the huge panoramic sunroof that many competitors offer. Ditto wireless device charging. The lack of adult leg room in the QX80 is comically inadequate—you have to wrestle your feet to the floor like you're stepping into a scuba suit. It is indeed luxurious inside, but not everywhere. 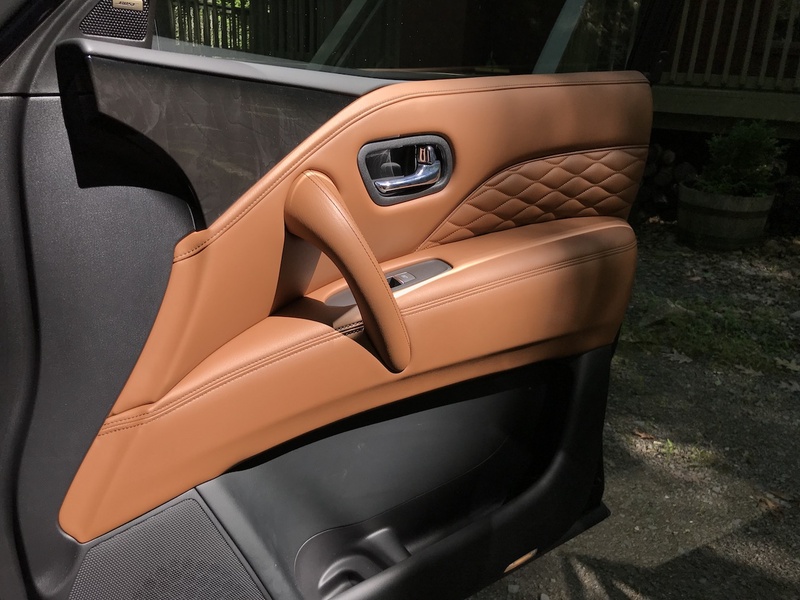 The center console is a tower of cheap plastic, and the doors lack the sort of heft you expect from a car the size of an armored personnel carrier. 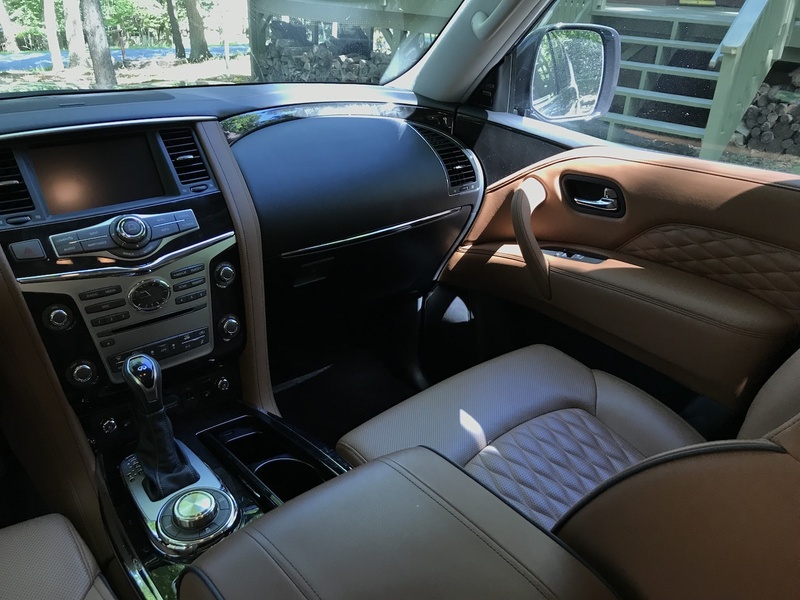 The QX80 is far handsomer than it was a year ago, and gives you lots of space (except that the third-row seat is only kind of usable) and a decent amount of luxury (when you're not noticing the cheap plastic). 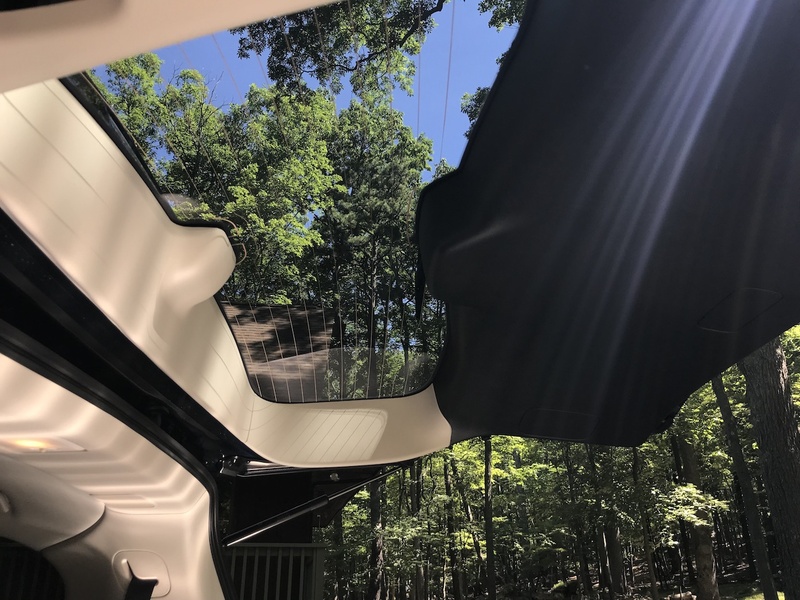 The ride is nice, it can tow a decent amount, and it has a passable suite of mostly passive safety systems—no doubt a prerequisite for any modern family-hauler. The weak spot is the in-car technology, which is both noticeably dated and lacking in content—there's not a lot there, and what is there is old. If you can live with that trade, it will save you some money: You'll get a lot of car, powered by a proven and eager naturally-aspirated V-8, that looks the part parked next to the newer crop of high-ticket, full-size SUVs.